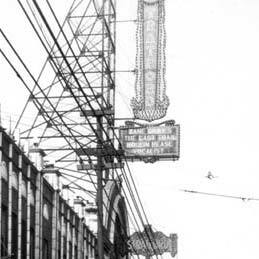 The Stratford was on the south side of 63rd St., near Union (about one block east of Halsted St.). 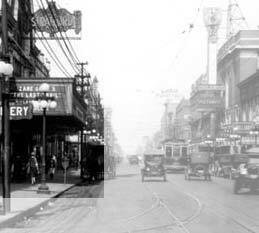 The Englewood Theatre was almost directly across the street. 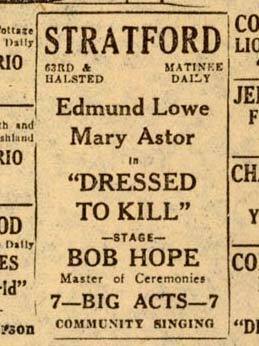 In addition to movies, the Stratford featured vaudeville actsusually four of them, but sometimes six. The Stratford was a well-attended neighborhood vaudeville theater, actually converted from a silent-movie house. They had built an apron out from the regular small stage so that the house could accommodate both a band and dance acts. The Stratford audience consisted mainly of loyal neighborhood people, so their likes and dislikes were unitary. If a performer clicked, "they let him live" and their noisy reception meant that a particular acrobatic dance team, singer, or baggy-pants comic had found a home. It was the sameperhaps even more sowith the emcee. What the Stratford provided for Hope was the loamy soil for producing the hallmarks of a personal style. He needed the experience of handling jokes of different types, and he got it here.